You know how some things set a standard. They become the benchmark by which all others are judged. Well, for many of my reviews I have mentioned the CZ 100 pistol as an example of what I consider to be just about the worst trigger ever made on any production handgun ever. I’ve mentioned it but until now I have never introduced it to you. That’s been rather rude of me and I apologize. Let me introduce it to you now. The CZ 100 is a polymer framed automatic that is a radical departure from CZ’s standard 75 series based guns. It is not just a polymer framed CZ 75 clone. If that is what you are wanting, check out an IMI Desert Eagle poly in 9, .40, or .45. I reviewed a pair of them last year. Those were outstanding handguns. One of the biggest departures from normal CZ tradition is that the 100 is a double action only pistol. The trigger mechanism is unique in that the idea behind it is simple to the point of almost being brilliant. Pulling the trigger moves a hook that grabs a bar on the striker and slingshots it back. At the farthest point of travel, the trigger hook drops off the striker allowing it to fly forward to fire the gun. I say “almost brilliant” because it of course fails miserably at being any sort of usable trigger at all. No, I’m serious, it’s bad. It’s the stuff of nightmares. The trigger feels exactly like those old toy guns you used to be able to buy at grocery stores that shoot those little plastic disks. I’ve actually had nightmares where a large dark looming threat is advancing on me and I pull out my sidearm and pull the trigger… it feels like this and in my dream little plastic disks fly out to bounce off the menace which is of course unfazed by the plastic disks. To put it bluntly, the CZ 100 is my nightmare pistol. Let me describe the trigger pull. A long take up pull, then heavy stacking up to a level that is off the scale. If the trigger pull was just bad, that would be one thing… but when the trigger breaks, it pulls the front sight off to the right suddenly. Trying as hard as I might, I could not pull the trigger without the sight being jerked off target. Interestingly, when I dry-fired the gun left handed, the sights stayed on target. I don’t know why that is… maybe it is the way I manipulate triggers and I just do it differently left handed. The trigger is not just bad, it’s funny how bad it is. It’s almost as if it’s a joke. How could a serious arms company release a pistol so awful? Actually, several have. AMT’s BackUp .45, the HK VP-70, Stanley Staplers, all have bad triggers on the epic scale, but the CZ 100’s is worse. Trust me. Now the question is this; is the 100 otherwise a decent pistol handicapped with a bad trigger? Let’s take a look at it objectively. When you first take up the 100, it feels pretty good in the hand. But the more you hold it, the more odd it feels. It gets to be downright awkward. The pistol’s styling is also interesting. They went to the trouble of making the gun as slick sided as possible, including the breaking of the slide release lever and take down pin into two separate parts instead of one combine unit. Then they hide the slide release under the frame and have the release lever sticking out an odd little window. It’s like a cross between something you might see on classic Star Trek and The Next Generation. The lines of the pistol are all wrong. Looking at it from a side view, it merely looks ugly. Change your viewing angle to look at it more from the front and it becomes absolutely hideous. This is the Pontiac Aztec of handguns. Like the Pontiac Aztec, even for being an abomination, it does offer good utility. For example, you can sometimes fine CZ 100’s for under $300’s. They are very reliable. It has a unique belt/holster snag feature up on the top to help aid in one hand slide manipulation. They needed this because you can’t quite hook your belt on the rear sights… because as a cruel joke they topped this pistol with an adjustable rear sight as if someone with a room temperature IQ might mistake it for a target pistol. There is the hint of frame rails under the muzzle, tempting one to think it a tactical pistol. All the tactical lights I’ve tried on it either don’t fit and even if they did, they are not able to lock on to it. So it isn’t a tactical gun, or a target gun, and being a 9mm it is not an overly powerful gun… so what is it? I’m not exactly sure. 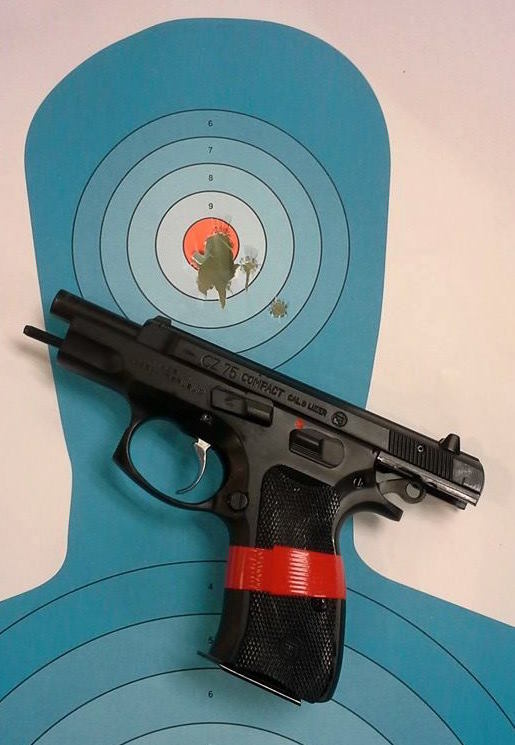 I guess it is trying to be a self defense gun. Let’s see if it is. If you can manage rowing that trigger all the way back, the gun will fire every time until you have emptied all 15 rounds. Of course you will feel like Ben Hur at the oars of a Roman galley by then, but still… the gun does work. That 15 round magazine is a decent payload for a gun so slim. The 100 is rather slick sided for being so ugly… but then again so is the Swamp Thing. 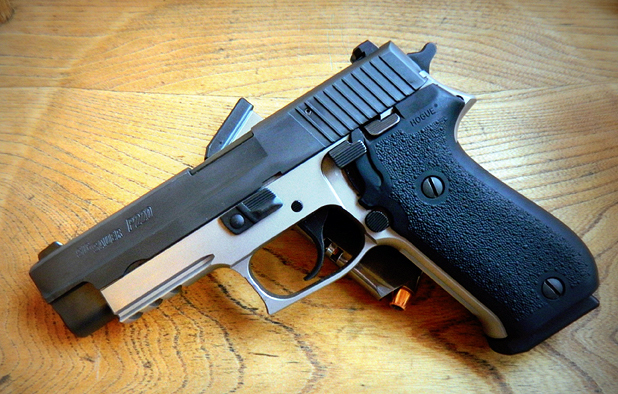 All this can be yours, an easy packing, reliable, high capacity 9MM, for under $300. Like your momma told you about lima beans, it doesn’t matter how bad it tastes, it’s good for you. I’ve actually seen examples for sale for as low as $225. At that price you are at the Makarov level. I’m not sure which one I’d buy if they were side by side for the same price, but I’d probably lean to the Mak. I don’t mean to bash the CZ 100 so completely, but I can’t help it. It is kind of like nachos… you can’t eat just one. Unless by one you mean a plate full. One plate full is a good stopping point. Those who are familiar to me, know that I am extremely fond of CZ firearms. So much so that one day I hope to make a pilgrimage to the Czech Republic to where CZ guns are made. My favorite handgun remains my CZ P-01. I especially like CZ’s magazine fed bolt action centerfire rifles. Dang near everything else from CZ I find to be excellent and most worthy. I wouldn’t hesitate to spend my own cash on anything from CZ, anything save the 100. The 100 is just awful and should be avoided as much as possible like it was mosquito borne West Nile Virus. Unless you are a full blown CZ Freak and just have to anything and everything from CZ. That being the case, I can’t blame you. The 100 is a very interesting pistol. You can’t help but to look at it. Like a weird mole on the face of someone you are trying to talk to. There is some weird fascination about it that draws you to it. And that is the oddest thing about the CZ-100… for all it’s warts, for as ugly and utterly nasty as it is… you can’t help but to kind of like it. Like ET in a way. Shooting the 100 well is a challenge and there in is the draw. It’s like riding a GP class bike with a tight clutch and a throttle like the trigger on a detonator. Awkward and difficult… it’s fantastic. But it’s not something for everyone. Unlike the GP bike, the 100 is awkward and difficult, but it isn’t for anyone. If this article contradicts its self, it is a good metaphor for the pistol. CZ USA could make this a much more appealing weapon system, but it would require a completely different fire system. I would suggest they take a close hard look at a couple other good fire control systems. Kahr Arms has perhaps one of the best examples of a DAO (Double Action Only) system. Then again they could do it as a Single Action system like the Springfield XD. That would be my choice if I was the Head Honcho at CZ. I’d also do something to the looks and the size. I would clip the grip frame down to “CZ Compact” size, and then recontour the slide to something more appropriate to concealed carry. The weird way the slide overhangs the dust cover at the muzzle end… reminds me of the front end (the bow, sorry) of an Aircraft Carrier. But considering that CZ’s lineup already has better pistols for these purposes… the P-01, the PCR, really there is no point in the 100. There is no necessity for CZ to force out a polymer framed pistol before it is really ready for prime time. The only reason for using a plastic frame is to reduce weight. The only gun that this is needed in are for guns intended specifically for concealment. And CZ has already done a poly version of the RAMI. I guess the best thing for CZ to do would be to just drop the gun altogether. Another thing about the 100 is that it has a brother. There is a .40 cal version that wasn’t imported into the USA. They called it the CZ-110. If you ever thought that the 100 was great, but it just needed a little more horsepower, well, your wrong. The 110 was just as bad as the 100 ever was but added snappier recoil. Good times. Ugly and awkward and now uncomfortable! Brilliant! To sum up the CZ 100 quickly, if you are a CZ collector, fine, get it. If not, spend your money on a more worthy pistol.